"Fish Foam is awesome stuff! I can’t believe how clean it gets everything and no streaks or drips. 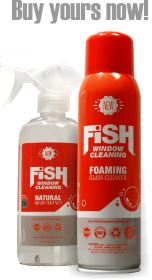 My husband was laughing last night because I was going around the house spraying Fish Foam on everything… windows, mirrors, glass tables and counter tops. It’s a great product!" "Who knew cleaning glass could be so fun? My cat Lily, proudly leaves her footprints all over my glass end-tables, and nothing gets rid of them like Fish Foam! And when I clean the refrigerator shelves with it I don't have to worry about the chemicals drifting into her food dish. I use my wonderful Fish Foam. I love that stuff!" "I decided to take some Fish Foam for the drawings we have at our Chamber of Commerce events. As you can imagine it drew some chuckles and I had to explain it was not recommended for marinating your salmon but worked great on windows, mirrors, and light fixtures. I have stuck with it through many events and now people that have won Fish Foam in the past started asking me how they could get more. Now when I hold the can up for the drawings they start chanting FISH FOAM! FISH FOAM!" "I really love how clean the glass gets using your product! A little goes a long way. I'm hoping my three cans last me a long time here at my house!" 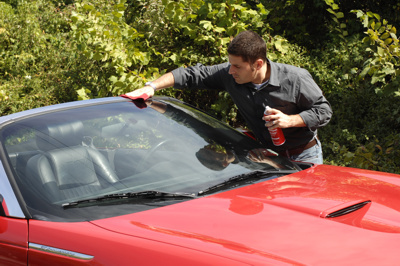 "It's the only glass cleaner I have in my home that I use for more than just cleaning windows. I can't keep it in stock, my husband loves giving away to friends and family." Copyright ©2019 Fish Window Cleaning. All rights reserved.